THE FAIRE: Things to See, Do, and Make! The Hand Drawn Photo Booth is a pretend photo booth “machine” operated by an artist. 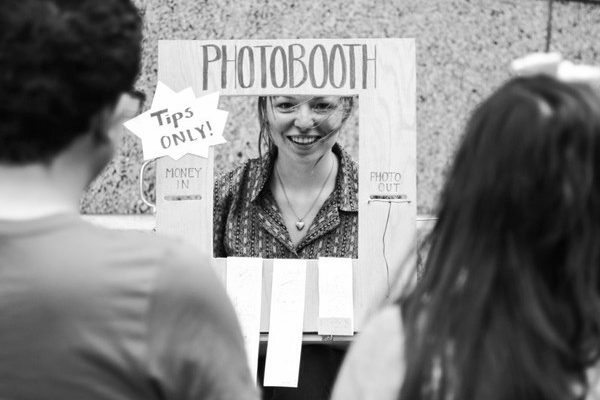 The exchange is performed through a feaux photo booth facade imitating a photo machine. The subject sits across from the artist where they strike and briefly hold 4 poses. Their likeness is quickly drawn in 3-5 minutes and delivered through the slot marked “photo out”; complete with mouth-powered sound effects. Salt Lake City Mini Maker Faire is community organized and independently produced under license from Maker Media, Inc.